Distribution of Eastern religions today (yellow), as opposed to Abrahamic religions (purple). The Eastern religions are the religions that originated in East, South and Southeast Asia and thus have dissimilarities with Western religions. This includes the East Asian religions (Shintoism, Sindoism, Taoism and Confucianism), Indian religions (Hinduism, Buddhism, Sikhism and Jainism) as well as animistic indigenous religions. This East-West religious distinction, just as with the East-West culture distinction, and the implications that arise from it, is broad and not precise. Furthermore, the geographical distinction has less meaning in the current context of global transculturation. While many Western observers attempt to distinguish between Eastern philosophies and religions, this is a distinction that does not exist in some Eastern traditions. Religions originating in the Indian subcontinent include Hinduism, Buddhism, Jainism, and Sikhism. The theologies and philosophies of these religions have several concepts in common, such as dharma, karma, maya and samsara. A 13th century Cambodian statue of Vishnu. Hinduism originated on the Indian subcontinent. It is considered by some to be the world's oldest extant major religion. Hinduism contains a vast body of scripture, divided as revealed and remembered, expounding on dharma, or religious living. Hindus consider the Vedas and the Upanishads as being among the foremost in authority, importance and antiquity. The Bhagavad Gītā, a treatise excerpted from the Mahābhārata, is sometimes called a summary of the spiritual teachings of the Vedas. It is difficult to identify any universal belief or practice in Hinduism, although prominent themes include: Dharma, Samsara, Karma, and Moksha. Hinduism is sometimes called a polytheistic religion, but this is an oversimplification. Hinduism includes a diverse collection of schools whose beliefs span monotheism, polytheism, pantheism, monism and even atheism. For instance, the Advaita Vedanta school holds that there is only one causal entity (Brahman), which manifests itself into all the various living and non-living forms that we observe, whereas traditions such as Vaishnavism and Shaivism worship Vishnu and Shiva in a relatively more monotheistic sense (caused by a differentiation between the parabrahman and atman). A number of scholars even consider the Samkhya school of thought to have atheistic leanings. Buddhism is a nontheistic Indian religion and philosophy. Buddhism was founded around the 5th century BCE in India by Siddhartha Gautama, the Buddha, with the Four Noble Truths and the Eightfold Path as its central principles. According to the scriptures, the Four Noble Truths were revealed by the Buddha in his first sermon after attaining enlightenment. The schools of Buddhism are typically divided into Theravada and Mahayana. In academic circles, Mahayana is further divided into East Asian and Tibetan Buddhism. Buddhism teaches that someone who becomes enlightened without instruction is a buddha. The primary goal of Buddhism is the liberation of the practitioner from samsara. Buddhists hold this to be the solution to the problem of suffering. This is the holiest Jain symbol. Jainism is the religion of the followers of Mahavira. He is said to be the 24th Tirthankara, or the 24th in a line of teachers espousing Jain principles. Jains reject the Vedas and highlight the practice of austerity. Jain philosophy states that the jiva, or soul, can escape the cycle of rebirth and death through strict ethical behavior. When nothing remains but the purity of the jiva, that person is called a jina, or winner, which is the origin of the term Jain. Karma is viewed as an accumulation that burdens the soul, causing attachment and suffering. Ahimsa, or non-violence, is central to Jain faith, philosophy and practice. It is interpreted very strictly as prohibiting all forms of harm to other living beings. Due to this, Jainism requires a strict vegetarian lifestyle. Ahimsa also applies to speaking, as one's words can cause harm and suffering. Sikhism is a religion which began in Punjab of Northern India. It is founded on the teachings of Guru Nanak Dev and the nine human gurus that followed. He received a vision to preach the way to enlightenment and God in Sultanpur. His views rejected the traditional worships and caste of the Hindu faith. Freedom from reincarnation is tied to remembrance and repetition on one universal God. God is formless and simultaneously in every form. Sikhs believe that there is one universal God who is the ultimate creator, sustainer, and destroyer. The Gurū Granth Sāhib are the central scriptures intended to preserve hymns and the teachings of the Sikh Gurus and other saints from Hindu and Sufi traditions. Rituals, religious ceremonies or empty worship are considered of little use and Sikhs are discouraged from fasting or going on pilgrimages. The tenets of Sikhism include (1) honest living/earning (2) tithing and giving alms (3) chanting on God. Sikhism also has a strong warrior tradition which arose in defense of religious freedom and human rights from a tyrannical Moghul occupation of India. The group of East Asian religions or philosophies share the concept of Tao. They may be considered as forming a group within world religions comparable to the Abrahamic or Dharmic groups. The Taoic faiths claim at least 500 million members worldwide. Taoism, also known as Daoism, comprises a variety of related religious and philosophical traditions. Categorization of Taoist sects and movements is very controversial. Taoist propriety and ethics places an emphasis on the Three Jewels of the Tao; love, moderation, humility. Taoist theology focuses on doctrines of wu wei ("non-action"), spontaneity, humanism, relativism and emptiness. Most traditional Chinese Taoists are polytheistic. There are disagreements regarding the proper composition of this pantheon. Popular Taoism typically presents the Jade Emperor as the head deity. 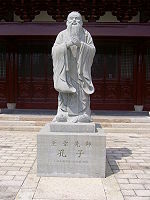 Intellectual, or "elite", Taoism usually presents Laozi and the Three Pure Ones at the top of the pantheon. Nature and ancestor spirits are common in popular Taoism. But this sort of shamanism is eschewed for an emphasis on internal alchemy among the "elite" Taoists. Tao itself is rarely an object of worship, being treated more like the South Asian concept of atman. A Shinto priest kneeling before a shrine. Shinto is an animistic folk religion practiced in Japan. Shinto literally means "the way of the gods". Many Japanese Shintoists also identify themselves as Buddhists. Japanese Pure Land Buddhism is deeply intertwined with the Shinto faith. Shinto practitioners commonly affirm tradition, family, nature, cleanliness and ritual observation as core values. Taoic influence is significant in their beliefs about nature and self-mastery. Ritual cleanliness is a central part of Shinto life. Shrines have a significant place in Shintoism, reflecting the animistic veneration of the kami. "Folk", or "popular", Shinto places an emphasis on shamanism, particularly divination, spirit possession and faith healing. "Sect" Shinto is a diverse group including mountain-worshippers and Confucian Shintoists. Confucianism is a complex system of moral, social and political thought, influential in the history of East Asia. It is debatable whether Confucianism is a religion or simply an ethical system. It is commonly associated with legalism but it rejects legalism for ritualism. It also endorses meritocracy as the ideal of nobility. Confucianism has a complicated system governing duties and etiquette in relationships. Confucian ethics focus on familial duty, loyalty and humaneness. Confucianism tolerates the Chinese folk recognition of the existence of animistic spirits, ghosts and deities. It approves paying them proper respect, but at a more fundamental level encourages avoiding them. Confucian thought is notable as the framework upon which the syncretic Neo-Confucianism was built. ^ Coogan, Michael David; Narayanan, Vasudha (2005). Eastern Religions: Origins, Beliefs, Practices, Holy Texts, Sacred Places. Oxford University Press. ISBN 0195221907. ^ Coward, Harold G.; Neumaier-Dargyay, Eva K.; Neufeldt, Ronald, eds. (1988). Readings in Eastern Religions. Wilfrid Laurier University Press. p. 1. ISBN 0889209553. ^ Gurdon Oxtoby, Willard (1996). World Religions: Eastern Traditions, Volume 2. Oxford University Press. ISBN 0195407504. ^ Morgan (2001). Pp 9-11. ^ York (2005). Pg 166. ^ Flood (1996). Pg 76. ^ Sharot (2001). Pp 71-72, 75-76. ^ Religious population statistics. These statistics are limited and do not reflect the full population of Taoic adherents due to complexities in definition and polling. ^ Leaman (1999). Pg 111. ^ Segal (2006). Pg 50. Maspero (1981). Pg 41. LaFargue (1994). Pg 283. ^ Pilgrim (1999). Pg 1. Ono (2004). Pp 97-99, 103-104. ^ Ono (2004). Pp 12, 51-52, 108. ^ Smart (2000). Pp 66. De Bary & Tu (1998). Pg 149. ^ Sharot (2001). Pp 46, 85. De Bary, William Theodore & Tu, Weiming. Confucianism and Human Rights. Columbia University Press (1998). ISBN 0-231-10936-9. Fisher, Mary Pat. Living Religions: An Encyclopaedia of the World's Faiths. I.B. Tauris (1997). ISBN 1-86064-148-2. Flood, Gavin D. An Introduction to Hinduism. Cambridge University Press (1996). ISBN 0-521-43304-5. Huang, Siu-chi. Essentials of Neo-Confucianism: Eight Major Philosophers of the Song and Ming Periods. Greenwood Press (1999). ISBN 0-313-26449-X. Leaman, Oliver. Key Concepts in Eastern Philosophy. Routledge (1999). ISBN 0-415-17362-0. LaFargue, Michael. Tao and Method: A Reasoned Approach to the Tao Te Ching. SUNY Press (1994). ISBN 0-7914-1601-1. Markham, Ian S. & Ruparell, Tinu. Encountering Religion: an introduction to the religions of the world. Blackwell Publishing (2001). ISBN 0-631-20674-4. Maspero, Henri. Translated by Frank A. Kierman, Jr. Taoism and Chinese Religion. University of Massachusetts (1981). Morgan, Diane. The Best Guide to Eastern Philosophy and Religion. St. Martin's Griffin (2001). ISBN 1-58063-197-5. Ono, Sakyo. Shinto: The Kami Way. Tuttle Publishing (2004). ISBN 0-8048-3557-8. Pilgrim, Richard B. Buddhism and the Arts of Japan. Columbia University Press (1999). ISBN 0-231-11347-1. Rausch, Thomas P. & Chapple, Christopher Key. The College Student's Introduction to Theology. Liturgical Press (1993). ISBN 0-8146-5841-5. Segal, Robert Alan. The Blackwell Companion to the Study of Religion. Blackwell Publishing (2006). ISBN 0-631-23216-8. Sharot, Stephen. A Comparative Sociology of World Religions: virtuosos, priests, and popular religion. NYU Press (2001). ISBN 0-8147-9805-5. Slingerland, Edward Gilman. Effortless Action: Wu-Wei as Conceptual Metaphor and Spiritual Ideal in Early China. Oxford University Press (2003). ISBN 0-19-513899-6. Smart, Ninian. World Philosophies. Routledge UK (2000). ISBN 0-415-22852-2. Swami Bhaskarananda. The Essentials of Hinduism. Viveka Press (1994). ISBN 1-884852-02-5. Weightman, Simon. Hinnells, John (ed). Handbook of Living Religions. Penguin Books (1997). ISBN 0-14-051480-5. Yao, Xinzhong. An Introduction to Confucianism. Cambridge University Press (2000). ISBN 0-521-64430-5. York, Michael. Pagan Theology: Paganism as a World Religion. NYU Press (2005). ISBN 0-8147-9708-3.